Touchwood Flooring contracts a mill shop to produce a wide variety of custom wooden accessories & details to compliment or enhance your hardwood flooring. These are the finishing touches to your floors and can turn an average install into something amazing. Visit our Edmonton showroom to see some examples on display! Wood heat registers and vents, along with wall mounted cold air returns, are the most common accessories for wood floors. Wood nosings can also be created along with t-caps and curvers. Custom wood pieces will be stained and finished to match or compliment your hardwood floors and are produced with consideration given to the species of wood, texture and finish. Laminated Nosings: Standard nosings are typically cut from a single board. When a curve requires a larger piece of wood than is available, a lamination is made. Multiple strips of wood, less than ¼” thick, are glued together and clamped around a form of the required shape. The piece is then planed, milled and finished, and the resulting nosing looks as though it came from one board. Curves: Curves are handled much the same as laminated nosings, minus the heavy rounded edging. Multiple strips of wood, less than ¼” thick, are glued together and clamped around the form of the required shape. The piece is then planed, milled and finished, and the result looks like it came from one board. Done correctly, even the grains of the wood line up. T-Caps: T-Caps are mouldings used mainly in floating floor installations to make transitions to adjoining flooring, bridge gaps through doorways, etc. They typically have a rounded top face, and are often thicker than the flooring. Unlike reducers or headers, they can’t be cut on site from the wood flooring itself, and the factory pieces available are limited. Precisely milled and matched T-Caps are available for seamless transitions. Wooden Floor Vents: Flush-mounted wooden vents (in-floor heat registers) are composed of a permanently installed frame, the same thickness as the hardwood floor, and a removable grill insert to facilitate duct cleaning. Rimmed vents are designed to fit over the duct work and proud of the flooring, with no installation necessary. The grills of both are fitted with dampers to control air flow. While the majority of hardwood vents are made from raw lumber, stained and finished, vents can also be milled from the flooring itself to provide an exact match. 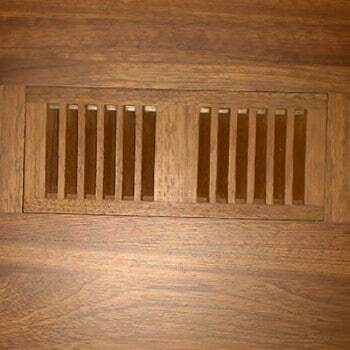 High velocity wood vents are designed to sit flush in the floor available in a variety if species & finishes. Example image below. We can create custom floor inlays for you, like medallions or borders, that can really add a wow factor to your hardwood floors. Hardwood Floor Medallions & Borders: Both of these custom flooring inlays borrow heavily from the art of parquetry: mosaics of numerous small pieces of contrasting woods and shapes glued to a substrate of ½” plywood, and subsequently installed into the main body of the flooring. Laser-cut designs and logos can be crafted to truly personalize an insert. Example image below or view our portfolio.